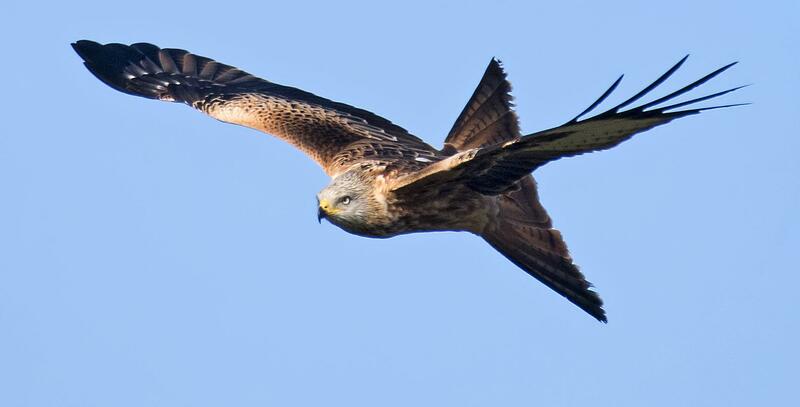 Red Kite. Photo Andy Thompson. All birds are amazing, but many will agree that there is something even more special about birds of prey and owls. The sight of a Barn Owl floating over a misty meadow at dusk or witnessing the speed and power of a hunting Peregrine or Sparrowhawk is something that is unlikely to be forgotten in a hurry. Here you will find all the information and facts and figures you need about each of our resident or regular migrant diurnal birds of prey and nocturnal owls. There are 16 species of bird of prey and five owls regularly encountered in the UK. Most, such as Buzzard, Sparrowhawk, Peregrine and all five owls are resident (present all year round). A small number, e.g. Osprey, Hobby and Honey Buzzard, are migratory; wintering further south arriving in UK in spring to breed before leaving again in late summer/autumn. One species, Rough-legged Buzzard, breeds much further north, and small numbers spend the winter with us. Rarities do turn up, some (Pallid Harrier, Gyr Falcon) more frequently than others. Eagle Owls are, once again, breeding in this country but the birds are generally believed to have originated from escaped and possibly deliberately (illegally) released captive birds. In total 28 species of bird of prey and 10 species of owl have been recorded in the wild here. A whole raft of other species have also been found, but these are usually escapes or accidental releases from captivity, or ship-assisted birds. It is worth remembering that there are many birds kept for falconry and display, ranging from small falcons to vultures, eagles and large owls, that may be encountered when free flying, or even escaped. Some, especially the falcons, can be hybrids or exotic species that can make identification very difficult. This may seem like a simple and easily answered question but it’s not! In fact, it is far from easy to answer and the more you look into it the more confusing it becomes. Red-backed Shrikes are in all respects birds of prey, but biologically they don't belong to the specific taxonomic groups that are labelled as 'birds of prey'. Photo Luke Delve. Often, we assume birds of prey eat meat, are predatory and have the sharp claws and hooked beaks necessary to despatch and deal with their meaty prey. Whilst in many cases this is true, some members of the tribe, such as Honey Buzzard, specialise in insects. The Palm Nut Vulture, an African species, feeds predominantly on vegetable matter. Indeed, it is not possible to classify birds as ‘birds of prey’ due to their diet of mammalian meat, as so many raptors and owls feed on insects, fish, other birds or even specialise on reptiles. Likewise, a whole host of non-birds of prey live on the same diets: gannets, auks and terns feed almost exclusively on fish, members of the heron family are superb predators taking mammals, fish, amphibians, reptiles, insects and even carrion. Shrikes share the same hooked beaks and sharp claws as birds of prey and live a predatory lifestyle. Known as butcherbirds, shrikes take large insects, small birds and reptiles and the larger species also take small mammals; in some older publications shrikes were even included as ‘honorary’ birds of prey! Insect-eaters abound in the bird world, and even seed-eaters usually offer insects to their growing young, so it is clear that we cannot use diet, or even presence of sharp claws and hooked beak, as a defining feature of birds of prey and owls. So, what is the answer?